We have not talked much about life on board in the diary so far, so today we'll take a trip around the ship. The first thing you notice as you board RRS James Cook is the amount of space there seems to be - and the second is the number of steps. Each doorway has a step to enter and a heavy door to open. Finding your way round is a challenge at first for those new to the ship. But it very soon it becomes familiar, and starts to feel like home. Our ship may have looked big on the dockside in Trinidad, but once at sea the seemingly spacious surroundings somehow shrink. You then realise how little exercise you are taking, when everything is just a few steps apart. There is, however, a small gym on board which some are using. Sunday is inspection day. This means the Captain and the Purser do the rounds of the ship checking for safety and cleanliness. Living in such close proximity to each other, and being at sea, it's not surprising that safety is top of the Captain's list. 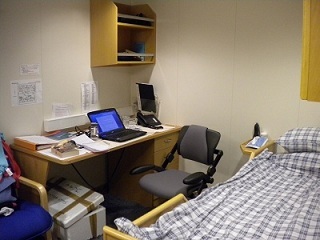 Inspection covers the entire ship, including our cabins. We are reminded daily of the need to conserve water. Although the ship makes her own water when we are under way, demand can still outstrip supply. So there are dire consequences for anyone caught placing only a few items in the washing machine, rather than a full load! The Second Officer, John Mitchell, is our medic onboard for this trip, dealing mainly with sea-sickness and minor cuts. Rarely does he need to use a needle to stitch wounds, preferring to use superglue and gauze instead. 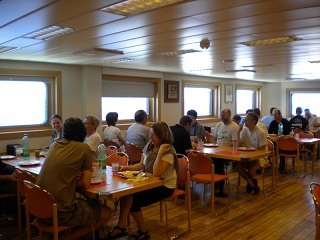 Our day seems to revolve around the three meal-times; one thing for sure is that you do not go hungry on board the RRS James Cook. We'll take a closer look at the galley tomorrow. The Captain led the daily briefing session today, starting with reminders on safety, and management of garbage. We separate all rubbish into burnable and non-burnable items. The non-burnables are stored for disposal when we reach land. The remainder of the briefing session focused on planning the science operations when we reach our target area. We talked about the importance of clear communications during these operations, particularly with the Bridge; with a significant amount of heavy equipment being sent over the side, this is crucial. So despite being in transit, our work continues. Over a 24-hour period the watches log readings, every 30 minutes, from the magnetometer, multi-beam sonar, gravity meter, and positioning systems. Data are recorded and stored both electronically and on paper, for use by our various team members on the ship and later back at home.